SWIFT CURRENT, Sask — Cody Straza encourages organic growers to use five soil health principles to improve their systems. Trying to implement all five is a challenge, he told a recent organic and low-input field day in Swift Current, but it can be done. Straza and his family operate Upland Organics on 2,100 acres near Wood Mountain, Sask. The first principle is to minimize soil disturbance. That’s something organic producers can struggle with. Using a cultivator instead of tandem discs or a Noble blade instead of the cultivator can help. But Straza has used a roller crimper for the past two years with good success. “We used to grow a clover or a pea crop and turn it in, turn the soil black. We heard the best way to capture that nitrogen is to turn that plant into the ground,” he said. Now the crimper turns that crop into a mat to create a soil armour, he said. It acts as a mulch to suppress the weeds and protect the soil. Straza said he had intended to direct seed through the crimped crop but did end up having to till it once. Keeping the soil covered is another principle he follows by using the soil armour. “We want rain but we don’t want this destructive force,” he said, showing a photograph of a raindrop smashing into the soil. If that rain hits mulch, its energy is diffused and it doesn’t displace soil. The thatch also keeps the soil at moderated temperatures. He used thermocouple data loggers placed an inch below the soil surface in fallow soil and under crimped rye and under living yellow clover. He set the devices to record the temperature every five minutes for three days and then graphed the results. “I kind of knew what to expect but the variance just blew me away,” he said. The variation in the bare soil was from a daytime high of 48.5 C to a nighttime low of 5.5 C.
Under the crimped rye, the range was 31 C to 12.5 C, and under the living clover the range was 26.5 C to 12 C.
The surface cover mitigates the temperatures and creates a more livable environment for young seedlings, Straza said. Biodiversity is a third principle that Straza manages through his crop choices. Changing cover crops is an easy way to increase diversity both below and above the ground. Different root structures affect the soil structure, and pollinators and wildlife benefit from different species above the ground. 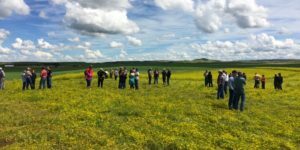 At Uplands Organics, two acres of less productive land have been registered to Operation Pollinator through the Saskatchewan Soil Conservation Association. Buffer areas that used to be kept fallow are now planted to pollinator crops. Straza said maintaining a continuous living root will feed the soil. One of the ways to maintain the root is with yellow clover. In the fall of 2016, Straza harvested lentils underseeded to yellow clover. He then disced in fall rye. The following spring the rye was up first, followed by the clover. The clover was crimped down in June and it remained dormant all summer. “We can change the soil in very little time,” he said. Finally, integrating livestock into organic operations is a principle that Straza has just begun this year to obtain the nutrients from manure and urine. A local rancher is grazing about 100 head on Straza’s cover crops of peas, oats and yellow clover. The cattle use five to seven acres each day and are moved daily. Straza said the results are variable. “Where the crop was nice, thick, heavy we’re getting beautiful trampling. The oats, they stripped the heads off first, then they went after the leaves and then the stalks got trampled in,” he said. But in areas of the field that didn’t have much growth, the cows ate what was there and trampled the field to dust. Straza said he doesn’t ever remember cattle on the land where they are currently grazing yet the dung beetles have arrived in the cow pies. One surprise was that after the cows ate the oats they headed next for the Canada thistle blossoms. That trampled the thistle plants and set them back extensively. “I think that, coupled maybe with some late season deep tillage, might really set it on its face,” he said of the weed.